I’ve always been intrigued by the idea of a fantasy world that made it to modern times. Not quite the same as urban fantasy, which tends to be our world with magical elements tossed in. More like a high fantasy world whose ancient empires never fell. A world where it makes sense for a warrior to wield both a gun and a sword, no matter how many people call it ludicrous. (Any idea you can make work is valid.) Why can’t there be a world with all the fantasy trappings (elves, dragons, floating mountains, magical artifacts hidden in old ruins) that has developed computers and jet planes? I like to imagine how magic and technology could interact. Magic might be a clean, efficient way to generate electricity. Or perhaps magic powers electronics in the first place. Airplanes might need to share the sky with slower, more luxurious airships. Perhaps attacks from magical creatures remain a genuine concern to the population. Like so many of my settings, this modern fantasy was born from a dream. My husband used to work at a bakery. One night every year, he had to work overtime to prepare for an influx of holiday customers. I always have a hard time sleeping while he’s away, except for one time. Perhaps it had something to do with the dream. Every time I drifted back to sleep, the dream resumed where it left off. It involved looking for one of my characters, following him through a bizarre mix of his world and mine. The character was Domerin (of course), and the dream had provided most of a novel plot. All that remained was to build and populate the world in which it took place. This is probably the setting that appears most often in my prompts (at least thirteen at the time of writing this). I refer to it simply as ‘modern fantasy,’ since the novel project doesn’t have a name yet. It’s also my most extensively developed setting to date. Unlike the space universe, this Domerin grew up with his parents. He and his mother have always been close, though he and his father never got along. Like the space universe, Domerin grew up in a city built in and around a massive forest. This city is powered by magic, ruled by a council of twelve Archmages who are responsible for fueling the city’s magical needs. The city is considered a protected historical site, so tourists are contained to a single district. As a native resident, however, Domerin can come and go as he pleases. As it turns out, Domerin mostly avoids his home city. Having no interest in following his father’s footsteps, and refusing to live in the man’s shadow, Domerin left home to forge a life for himself. He started as a wandering mercenary, trading his skills for food and lodging more often than money. Though he gained a formidable reputation in certain circles, it was a humble existence compared to the life he left behind. One morning, an elemental attacked the city in which he sought work. Elementals are huge creatures, the size of city skyscrapers, usually endowed with the power of a specific element. Due to their size and the scope of their power, they’re both deadly and extremely difficult to kill. In fact, the queen has a group of specially trained solders to manage disasters such as these. Civilians are usually instructed to evacuate until the Queen’s Division can manage the situation. In this case, Domerin found citizens unable to flee and lingered, distracting the creature until help could arrive. The Queen’s Division was so impressed with his skill, they offered him an opportunity to join their ranks. Since joining the Queen’s Division, Domerin has done well for himself. He has been stationed in the capital, which means tackling some of the division’s most challenging and dangerous cases. It has also allowed him to set down roots. His deeds and exploits have become quite well known, since heroes in this world are subject to the same popular press as celebrities. Domerin isn’t the only major character to occupy this world. It’s actually a convergence point for many of my favorites including Rose, Silkfoot, Cazella and Lillianna/Phage. Rose is queen of the country which Domerin serves. Most of her initial encounters with him were brief, but she has kept a close eye on his career. Rose was born with a particularly strong sense of foresight. It’s so strong, in fact, that it has marked her physically. Her eyes bear no iris or pupil. Instead, they look much like the night sky, filled with flickering starlight. Most people cannot stand to be the subject of her gaze for long. This ability often manifests itself when Rose first meets someone. Sometimes she sees an event from their past, sometimes a hint of their future, and sometimes she simply gains a sense of their personality. The flash of past Rose glimpsed when she first met Domerin convinced her that she could trust him with matters of great importance. Many years later, Domerin developed a personal relationship with the queen. Rose eventually offered to bear children for Domerin and his partner, Crescent, an offer they decided to accept. They have three children; Domerin’s son Dormal, and Crescent’s twins Silverbell and Valerian. Domerin encountered Lilianna McDougal on one of his missions. Lilianna, who often goes by the hacker moniker ‘Phage,’ was stolen from her parents as a baby. Her abductors performed illegal experiments on her to pervert her psychic abilities to work with machines. Now she can plug herself into computers and interface with computer networks via thought. But the procedures had a permanent affect on her body, leaving her frail and dependent on technology to survive. After Domerin freed her from captivity, Lilianna agreed to enter Rose’s service, acting as something of a switchboard for the nation’s vast computer network. Around this time she dropped the name ‘Phage’ and adopted ‘Mainframe’ instead. She now works at the center of research and development for the Queen’s Division, designing and testing new technologies for their use. Silkfoot travels the world working his particular magic (strategic redistribution of resources), but interacts with the other characters from time to time. 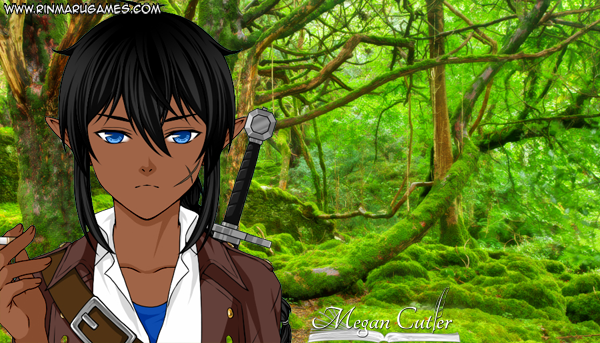 He and Cazella play a lesser role in central events but, of course, have their own stories within the setting. Wonderful! I love that your setting evolved out of a dream. Dreams play a big part in my writing, too. I also love the idea of writing multiple stories in one setting. I think that gives such richness to the various stories! So you write separate stories in the same universe as your novel? That’s cool. I like it when that happens, and especially when they can be read independently but still familiarity–like Pratchett’s DiscWorld novels.